Dollamur GymTurf™ Indoor Sports Turf - GymTurf by Dollamur is a portable, roll-out indoor sports turf flooring solution available in 25' and 50' rolls for crossfit, sports performance training, and field sports application. GymTurf is the most versatile synthetic turf product available for fitness gyms, boot camps, school gymnasiums, and any other indoor sports facility. Portable and convenient, GymTurf just rolls-out and can be set up in just minutes for temporary or permanent installation. By connecting GymTurf side by side across an entire floor, school gyms can now become multi-use to accommodate summer camps, sports practice, after school programs, and much more. By laying turf rolls end to end for longer runs, boot camp facilities and crossfit boxes can benefit from indoor turf tracks for sprint training, plyometric fitness workouts, and conditioning training. At five feet wide, GymTurf is perfect for weighted power sleds for push and pull sled training. Don't let the weather stop your practice! GymTurf can give you an edge over the competition by no longer restricting your practice and conditioning training due to weather. GymTurf offers the ideal traction and performance to protect players and athletes for any sport or functional fitness activity, any time, in any weather, 365 days a year. GymTurf incorporates many patented technologies to produce the highest quality, multi-sport surface available today. Dollamur synthetic turf rolls are manufactured using the latest in athletic foam technology. Durable, non-abrasive athletic turf is bonded to low-impact padded foam. 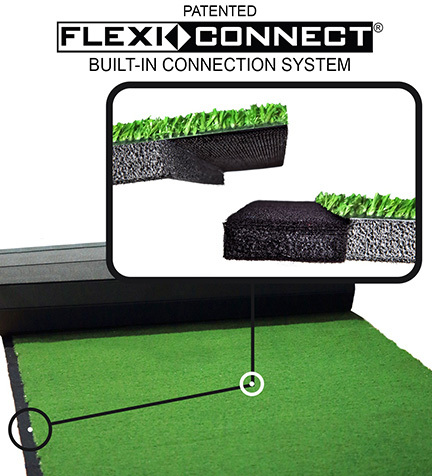 GymTurf uses 5/8" thick closed-cell, cross-linked foam providing effective shock absorption and sustained durability through its high density weight of 4 pounds per cubic foot. The athletic polyethylene foam backer will never harden or shrink allowing turf rolls to maintain usage performance year after year. The non-slip bottom grips hard wood gymnasium floors as well as rolled rubber gym flooring to create an ideal playing field or functional training surface that will not move under stop-and-go acceleration. And, the "No Slip - Just Grip" high traction synthetic grass top surface will allow the ability to safely execute at full speed and mobility to maximize your training and practice needs. Need a custom quote for larger gym floor applications requiring multiple turf rolls? Contact an IRON COMPANY® indoor sports flooring specialist today at 1-888-758-7527 or email quotes@ironcompany.com. Weight: 11.5 oz. / sq. ft. Turf Tuft Bind Strength: > 6 lbs. Foam Density: 4 lbs. / cubic ft.
Made to order. Please allow up to 4 weeks manufacturer production lead time prior to shipping.